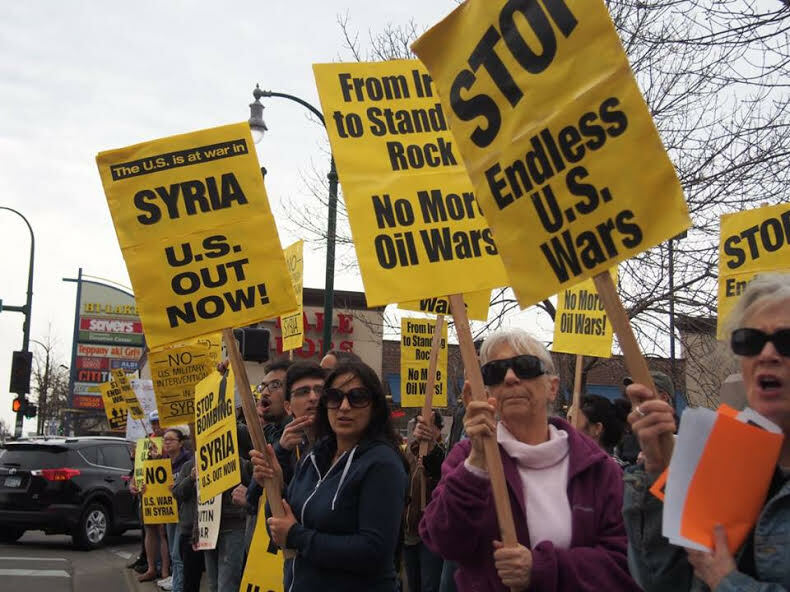 Minneapolis protest demands “Hands off Syria” | Fight Back! Minneapolis, MN - In response to the recent U.S. air strikes against Syrian military targets by the Trump administration, over 200 people joined a Minneapolis anti-war protest on Saturday, April 8. The protest, organized in just a day and a half, was initiated by the Minnesota Peace Action Coalition. (MPAC) The protest was held along the sidewalks along the very busy Lake Street and Hiawatha Ave shopping area. Thousands of people driving and walking by saw the protest. Many people waved and expressed support for the anti-war message. 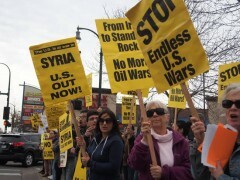 The protest was organized under the call of “Say no to U.S. war on Syria.” Many groups and individuals helped to get out the word about the protest through Facebook, phone calls and e-mail announcements. Aby-Keirstead also told the crowd to be ready to give solidarity to anti-war protesters who were attacked by police and arrested in Jacksonville, Florida on Friday. Organizers also pointed to the growing danger of new escalations of U.S. military intervention in Yemen and Somalia. The MPAC coalition announced their next action at the protest. MPAC will hold a protest on Tuesday, April 11 at 4:30 p.m. at the offices of Minnesota U.S. Senator Amy Klobuchar to speak out against the escalation of U.S. intervention.